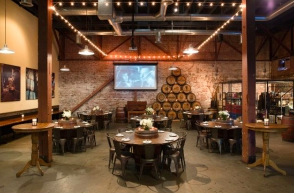 The room evokes the spacious feeling of a Jaliscan Mercado with exposed wooden beams, a stunning reserve bottle display, and antique Tequila barrels. The large, paneled photos along one wall recreate the Tequila production process. Authentic cuisine from local California products is served family-style out of authentic taco carts imported from Guadalajara, Mexico.